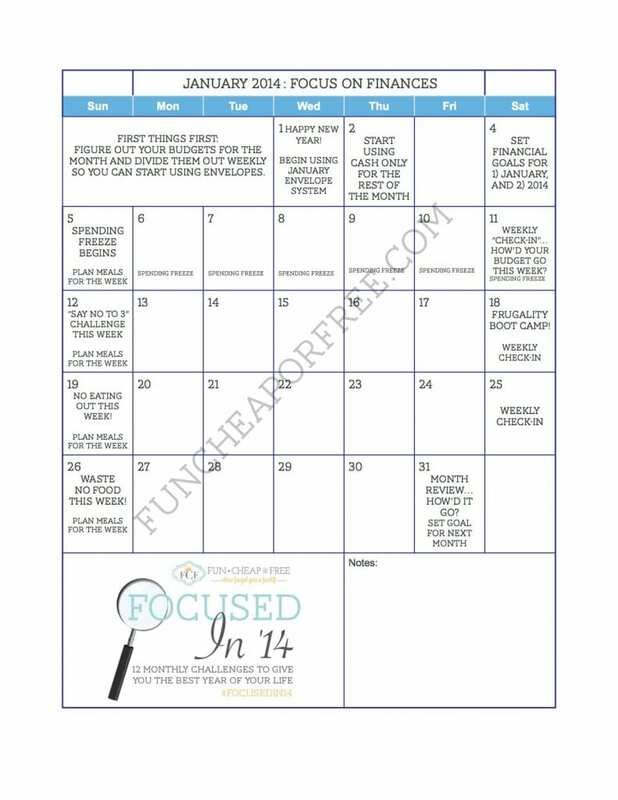 As I mentioned the other day, I've created a FREE CALENDAR PRINTABLE for January's “Focus on Finances” month. It's a great way to follow along to ensure you pace yourself and stay on-track! First…you've got to figure out what your budgets are! THIS POST gives a good idea on how to do that. 1. Begin using the envelope system to track and hold your cash. I recommend having one envelope for “grocery” and one envelope for “other”. See tomorrow's post for how I'm doing this. 2. Cash-only this month!! See HERE for how this is done. 3. Sit down with your spouse, partner, or your alter-ego and set some goals! I will post a printable and guidelines/tips for goals on Saturday. Start thinking now, though! 4. Spending freeze begins! Check back Sunday for all the rules on how this spending freeze should work. 5. One of the easiest and greatest ways to save money is plan your meals out in advance! Every Sunday turn on your favorite show, grab your favorite cook book or pull up your favorite Pinterest board, and don't stop until you have your meals planned out! Look in your fridge, freezer, and pantry first for things you need to use up. I like to use Deals To Meals because she has great meal plans based around what's on sale that week. See how I grocery shop for how it all works. Also see this post for good meal planning ideas. 6. At the end of every week (Saturday) sit down and see how you did! Sit down with your spouse and go over your budgets. The way to talk about finances without crying? You talk about YOUR budgets and let them talk about THEIR budgets. It avoids “you” statements and allows you to critique yourself rather than critiquing the other person. A few more tips on that here. I usually use Sunday as my organization day, because religiously I never spend money on Sundays anyway so it doesn't mess up my budget. You do what's best for you! Whenever you do it, just be sure to look over your budget, and physically take any extra cash and put it toward debt first, savings second, then Slush Fund 3rd. Prepare yourself for the coming week. Look at your calendar. If you have lunch with the girls and dinner with friends, go light on groceries to leave plenty of room for your “other” budget. 7. Oops! I'm out of order here and too lazy to change it. But just know that Frugality Boot Camp is coming up! Talk about an amazing way to get your finances in check. It's a full day of everything you could ever need to know about frugal living, finances, talking toy our spouse about money, the whole 9 yards. We are even offering virtual tickets for those who aren't in Utah so you can still “attend” virtually, on your own time! Check it all out here. 8. Spoiler alert…our next challenge for January will be saying no to 3 things that week that you WANT but don't NEED. The real challenge will be to make them big. Not just a “oh I guess I won't buy that $1 drink”…but to really challenge yourself! More on that as it draws closer. 9. An “eating out” freeze! No eating out – at all – for an entire week. That includes gas station drinks, coffee, dinner, lunch, drive-through…nada! Brown-bag it or go without. More on this as it draws closer. 10. This is a recipe challenge week! The goal is to not throw out any food for an entire week. Leftovers, bruised fruit, mushy veggies, nothing! We'll show you lots of creative ways to reuse food and make it delicious again. More on this as it draws closer. 11. This end-of-week review will be an overall month review. How'd you do? Did you reach your goal? How do you feel? Go on a date with your spouse and talk it over…and feel proud of yourself for all your success! More on this as it draws closer. 12. Take notes throughout the month! Jot down to-do's, ideas, love notes, whatever helps. But be proactive! Be forward-thinking! If I'm missing something that you need to work on, take note and challenge yourself. 13. We will be filling in the blank days as the month goes on, with tips, ideas, and ways to live frugally and achieve your goals. Now, get out there and start saving! We have long-standing dinner plans with friends on the 10th, which we planned months ago. It is in the spending freeze. We have a $15 gift card that we got for a gift that will go towards our meal but we will need to spend another probably $15 for our meal. This bums me out, because I meal planned through the freeze. What do you recommend? That’s tough…but don’t break your plans! You can either postpone your freeze for a week, or extend your freeze for one day. So spend money on dinner (and try to buy nothing else) and then extend your freeze one extra day. Or just go really reasonable at dinner, be as frugal as you can, and call it an exception. Your call! Thank you for responding so promptly! My husband and I are so excited to start following your challenge so we can start saving for our first house together. The only other exception that I would have for the freeze is that my husband drives an hour and a half to work each way so he needs to fill his tank up twice a week to make that commute. Can I just say that you are one of the sweetest people ever? I love how genuine and relateable your posts are. I look forward to reading your blog everyday when I wake up! It’s the first thing I do (: Happy New Year from Plainville, MA!! This is great! You are bloggin’ up a storm this year, love it! hi. I really enjoying your blog, and am keen to participate, however I am having heaps of trouble opning the calender/envelopes etc. one of them is 32mb, and just will not open. Oh my goodness sorry about that! And that’s good to know. Email me, I’ll send it to you directly. I’m so excited to begin the challenge and start cutting down debt!! I am going to do all of the ideas for January in February as I get paid once a month (boo!) and it’s at the end of the month. I am going to try to rein in my budget for January though in preparation for going big in February!! I recently came across your site and I love it. It’s really helped me to think about my saving goals. I’m a little late to your January Finance Challenge, but it’s inspired me to make a calendar/challenge for myself for April and possibly beyond. I think this would be a great and challenging way to save money, especially since I’ve gone off track and it’s still the beginning of March . So glad you like it, thanks for reading!! 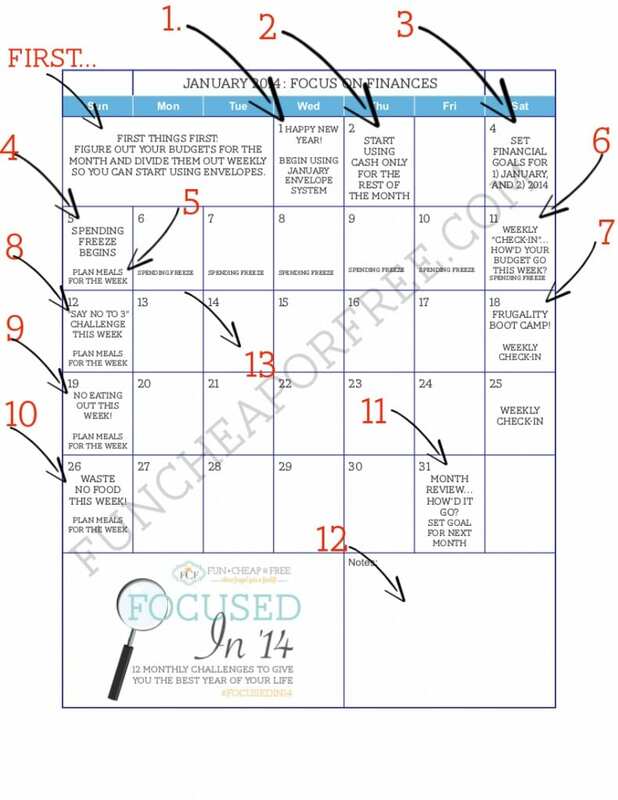 will you do another one of these “focus on finances’ month soon? would love to follow along and learn some tips. I loved your shelf cooking and stocktober!